Michael Bellefountaine is carried away by police in an ACT UP Maine protest against AIDS and the Iraq War, Jan. 23, 1991. 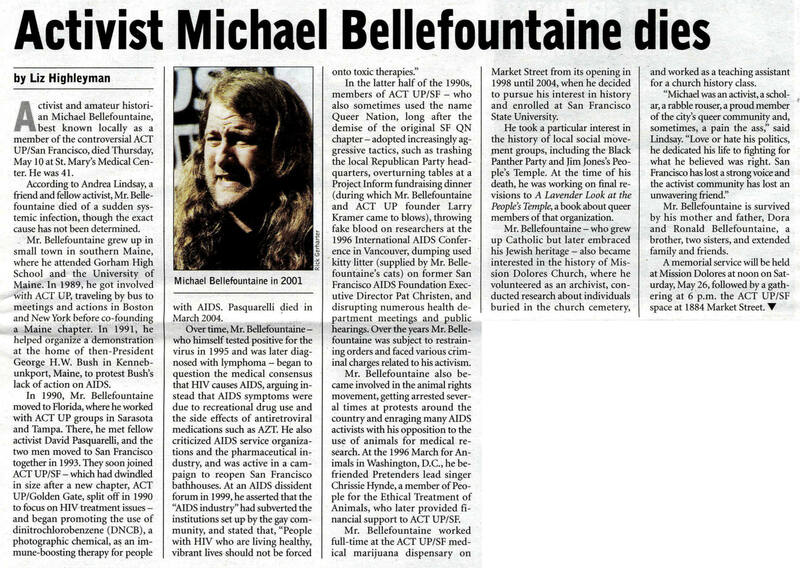 On the occasion of the 10th anniversary of the death of ACT UP activist Michael Bellefountaine, let’s take a look back to his formative years as a direct action activist. Hailing from rural Maine, Michael was among the first generation of queers who came out in the early shadow of ACT UP’s militant approach to fighting AIDS. The organization just celebrated the 30th anniversary of its first demonstration in April, 1987. It was a much different time back then to be out, loud and proud; one that required a hefty amount of courage and perseverance. By 1989 Michael was traveling to Boston and New York by bus to participate in meetings and actions where he learned the basics of a new movement in AIDS activism that was as informed as it was confrontational. In the summer of 1990 he was one of the co-founders of ACT UP Maine along with C.T. Butler. Butler was also one of the founders of Food Not Bombs whose use of consensus for group process and decision making became a core of Bellefountaine’s involvement with ACT UP and other direct action movements such as animal rights. AIDS activist Michael Bellefountaine marches in Portland, Maine’s gay pride march circa 1990. Among the dozens of boxes in the ACT UP Archives still to be processed, there is one with Michael’s material of activism which predates his arrival in San Francisco, with David Pasquarelli, at the end of 1993. For several months I’ve been digitizing a small binder of photocopies from ACT UP Maine’s first action in the summer of 1990 until Michael’s move to Florida in 1992. Now that those photocopies and a couple of darkening news clippings have been scanned, I’ll begin highlighting selections from the news coverage of ACT UP Maine. For many years ACT UP SF’s detractors attempted to delegitimize the radical dissident chapter in the tiresome gay political parlor game of whose right it is to use that five letter acronym. These documents help illustrate the foundation of Michael Bellefountaine’s fifteen years of ACT UP activism which came from direct participation in the actions and demonstrations of the its original East Coast roots, with a strong emphasis on people with AIDS and HIV living in rural communities. Casgow Bay Weekly, Jan. 31, 1991. CLICK TO ENLARGE. Though it began in the waining years of the Regean administration, ACT UP came into its own during the Presidency of George H.W. Bush. Among the group’s most celebrated actions was the Day of Desperation on January 23, 1991– coordinated protest against Bush’s Persian Gulf War and the perpetuation of armed conflict in the Middle East. Portland Press Herald, Jan. 24, 1991. CLICK TO ENLARGE. ACT UP Maine also took the streets that morning as the war approached six months of death and environmental destruction in the Persian Gulf. Like many rural chapters, ACT UP Maine harnessed the national protests to call attention to local issues affecting people with AIDS and HIV. Ultimately 10 members of the group were arrested for blocking traffic in downtown Portland. 6 men and 4 women lay down across Congress Street at Monument Square during a lunch hour march and rally. The choice of location maximized exposure to ACT UP Maine’s message challenging the government’s misdirection of priorities and funding. Speakers blamed leaders from both the state and the nation for creating a mood of public apathy and indifference. Their demands included AIDS specific clinics and that doctor’s ensure care for patients without insurance. Sarasota Herald Tribune, Feb. 1, 1991. CLICK TO ENLARGE. The best coverage of the demo came from the Jan. 24, 1991 Portland Press Herald which featured a pair of eye-catching photos including the iconic image of Bellefountaine being dragged off by Portland Police officers. That striking photograph was picked up by wire news services and reprinted across the nation. Here’s a clipping printed the following week in the Sarasota Herald Tribune. The best quote came from Portland Police Chief Michael Chitwood, “They advertised it all over town that they expected to block traffic and do civil disobedience type of things.” The “advertisements” were likely flyers wheat pasted around town encouraging citizens to participate while informing them of the reasons for the scheduled protest. After speeches, ACT UP Maine activists ignited flares atop placards as 10 participants darted into the street and laid on their backs until they were forcibly removed by law enforcement. Charged with misdemeanor citations for obstructing a public way, the activists were transported to the Cumberland County Jail. Portland Evening Express, Jan. 24, 1991. CLICK TO ENLARGE. As our country continues its destructive journey on the bloody path of endless war, it’s the legacy of direct action activists like Michael Bellefountaine whose 15 year commitment to ACT UP’s struggle for justice and dignity for people with AIDS and the still unfulfilled promise of queer liberation that provides perspective and inspiration to continue the persistence of resistance.